INDIAN WELLS, Calif. (AP) — A record-breaking number of wealthy donors have gathered at conservative billionaire industrialist Charles Koch’s private weekend retreat, where leaders of the powerful political network have taken a decidedly different, more politically muted tone than in years past. Though the Kochs as GOP icons have been up front about their strained relationship with Donald Trump, the network’s latest biannual meeting comes just as the president conceded his immediate border wall demand to reopen the government after the longest shutdown in history and Democrats took control of the U.S. House of Representatives in the aftermath of the 2018 election. “This network has taken its effectiveness to a whole new level,” Koch said. 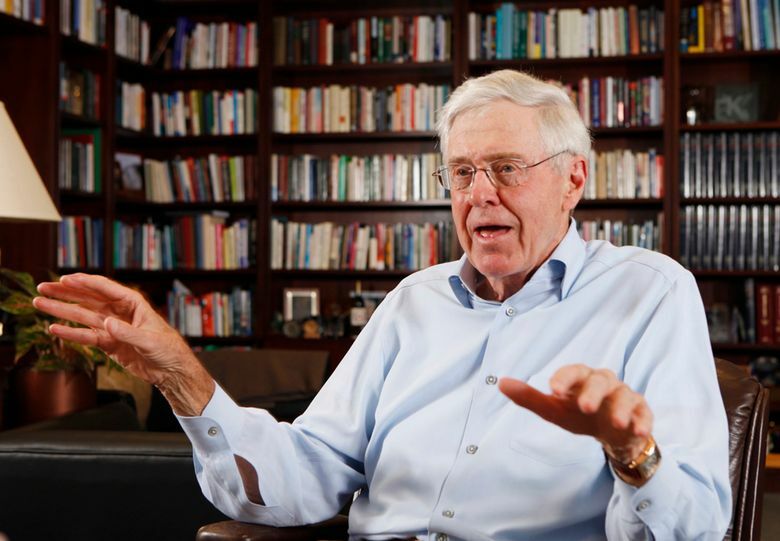 The meeting held at a luxury resort in the California desert caters to donors who have committed to giving at least $100,000 annually to the sprawling Koch Network of political, policy, educational and philanthropic organizations. There are 634 donors attending the retreat, including 181 of them as first-timers. Prominent Koch donor Doug Deason of Texas said the reported infighting between Koch and Trump was “old news” and that conservatives have united, especially after Democrats took control of the House. “I just don’t think there was a huge amount of animosity. It was blown out of proportion,” Deason said. Long seen as GOP kingmakers best known for their pro-business agenda, libertarian leanings and support for the tea party movement, David and Charles Koch have in recent years made waves by lambasting Trump and his administration. They refused to back Trump during the 2016 election, vowed to hold him accountable to conservative priorities like free trade, free markets and small government and have been outspoken against the White House on immigration and infrastructure spending. Some donors had publicly expressed disappointment over the Koch Network’s battles with Trump, but the network is unfazed. Koch recently announced it won’t support Trump’s 2020 re-election bid and instead would back races for the U.S. Senate and House and state legislative seats to make the greatest impact. “We’ve found overwhelming support that reaffirms the strengths of our partnerships. This is borne out by the fact that we will welcome our largest group of supporters this weekend in Palm Springs,” Koch Network spokesman James Davis said in a statement. With Vice President Mike Pence as a longtime Koch ally, there have been inroads and policy wins. The Koch network was influential in the 2017 GOP tax overhaul and 2018 prison reform signed by Trump. The weekend’s events will feature seminars revealing the network’s latest work and agenda, as well as elected officials and other influencers. Republican politicians including U.S. Senators Mike Lee of Utah and Ben Sasse of Nebraska and Kentucky Governor Matt Bevin are in attendance. The Associated Press is among a limited number of media organizations invited to cover parts of the private retreat on the condition that donors must give their permission to be identified.